LOS ANGELES — Following a statement win vs. UCLA last week, the Trojans looked to build momentum in Pac-12 play as they welcomed the Arizona Wildcats to the Galen Center. The Wildcats, who came into the game 2nd in the Pac-12 standings, were simply unable to find their groove offensively all night. USC got off to hot start, jumping out to a 14-7 lead behind 6 early points from Nick Rakocevic and stifling defense that drew a standing ovation from the crowd. The game was also the return of freshman standout Kevin Porter Jr., who missed the previous few games due to a suspension. He returned to action tonight and promptly drilled a three-pointer to extend USC’s lead to 19-10. Porter Jr. finished the game with 14 points and 3 rebounds. At the half, the Trojans capped off a dominant first 20 minutes with a Derryck Thornton three-pointer as time expired to hold a 36-19 lead. USC outrebounded Arizona 28-17 and outscored them in the paint 20-10, mainly due to the Wildcats having no answer for Rakocevic down low. Sean Miller’s unit also struggled offensively, shooting a dismal 21% in the first half. In the 2nd half, the Trojans maintained their intensity and stretched their lead to 20 off a Bennie Boatwright three pointer. Arizona struggled to find their shot all night and finished the game 5-25 from beyond the arc and 28% for the game. 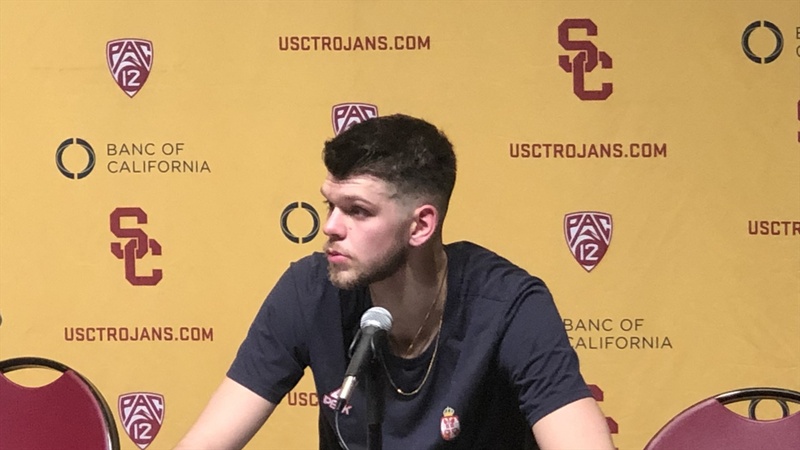 Nick Rakocevic led the Trojans once again with a 27 point, 13 rebound double-double while Bennie Boatwright chipped in 12 points and 12 rebounds. Overall, after a tough Oregon road trip, USC has bounced back with two quality wins and have reinserted themselves into Pac-12 contention. Up next, USC will welcome the Arizona State Sun Devils to the Galen Center on Saturday at 5:00.